Time is ticking for Theresa May. It has been a bad week for her after a bad month and a bad year. Her humiliation at the hands of Jean-Claude Juncker, the Irish prime minister Leo Varadkar and the DUP weakened her further – if such a thing is possible – which must have left Jeremy Corbyn licking his lips at the prospects of today’s PMQs. In the event the Labour leader rolled out some good attack lines without quite ever landing the blow necessary for a decisive victory. There was no sign of questions sent it by members of the public but Corbyn began with another one of his favoured tactics – throwing a Tory quote back at their leader. Britain’s trade talks after Brexit will be the “easiest in human history”, Liam Fox had said in July. Nearly 18 months after the referendum, however, there is no sniff of a commercial agreement everywhere. There is no real answer, of course, because May has played a weak hand very badly and the Tories are still at war over our country’s departure from the EU. As Corbyn carried on he stuck to the tactic and used a quote from Charlie Mullins, the luxuriously tousled Tory donor who this week said May’s incompetence is “hobbling” the Brexit negotiations and derided her colleagues as “that bunch of jellyfish masquerading as the cabinet”. May had no answer, but she rarely does to the jibes. Sharp banter is not the PM’s style but she was helped by the fact Corbyn’s intervetions sometimes meander away without coming to a question or hard pay-off. He raised the DUP’s decision to block May’s Brexit deal this week as a case of the “tail wagging the dog” but he might have made more progress if he had tried to pin down the PM on what she said to the unionists’ leader Arlene Foster, when, and the response she received. Meanwhile May’s line that she had made “very good progress” on Brexit talks prompted gales of laughter. Corbyn’s oft-repeated line is that the chaos presided over by May means the Tories should shape up or “get out of the way”. This will play out well on the television news – which is, basically, one of the few gains for opposition leaders from the weekly session – but it is not one that will work long term because it begs the question of, is Labour calling for a general election? There is little likelihood of one before we drop out of the EU in March 2019 so what exactly does it mean to “get out of the way”? We don’t have to answer that now. This was not a vintage session for either of the main party leaders. 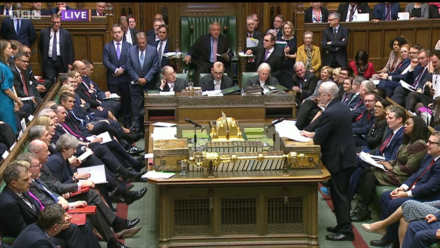 Corbyn seemed to have the better of it although there were moments when May rose to the despatch box with a wide grin on her face. On one occasion this was because she was deploying her scripted attack on Labour over its promises to students, which were to abolish tuition fees and “deal with” the issue of historic debt. May quoted a Labour leaflet which she said promised to “cancel existing student debt” and was apparently put out by Luke Pollard, the MP for Plymouth Sutton and Devonport, who took the seat with a huge swing towards our party. Pollard later said the promotional sheet had been drawn up by “over-enthusiastic volunteers” without his knowledge. It was a session that seemed that to unite the pundits in that it generated more heat than light after close to 50 minutes of questions. Neither May nor Corbyn is given to fireworks. The Labour leader ended his six questions with a declaration that Tory failures over Brexit, social care, the NHS and universal credit meant “this really is a shambles”. He was right, the Tories are sinking under the weight of their own contradictions but Corbyn didn’t quite move May any nearer to an exit from Downing Street. The PM will continue to be imprisoned by a Brexit she voted against. With an election, to my mind, many years off then Labour should focus on pulling apart the Tory Brexit positions on trade, growth, regulation, rights and so much else which have crippled this government and made a misery of May’s premiership. This article was amended on December 7 after more information was provided by Luke Pollard.